Weaning was a much bigger deal than I'd originally thought it would be. I always looked forward to when Oliver would have his first foods but when it came down to it, I realised I actually had no idea how to do it. What do you give first, and what time of the day? What if he chokes? Olivers been having solids for around a month now. He's still having mostly purees but he also has fruit and wafers for a snack. Like everything else baby related, it was all trial and error before we found our feet but I definitely feel more confident now to carry on weaning onto more solid foods. 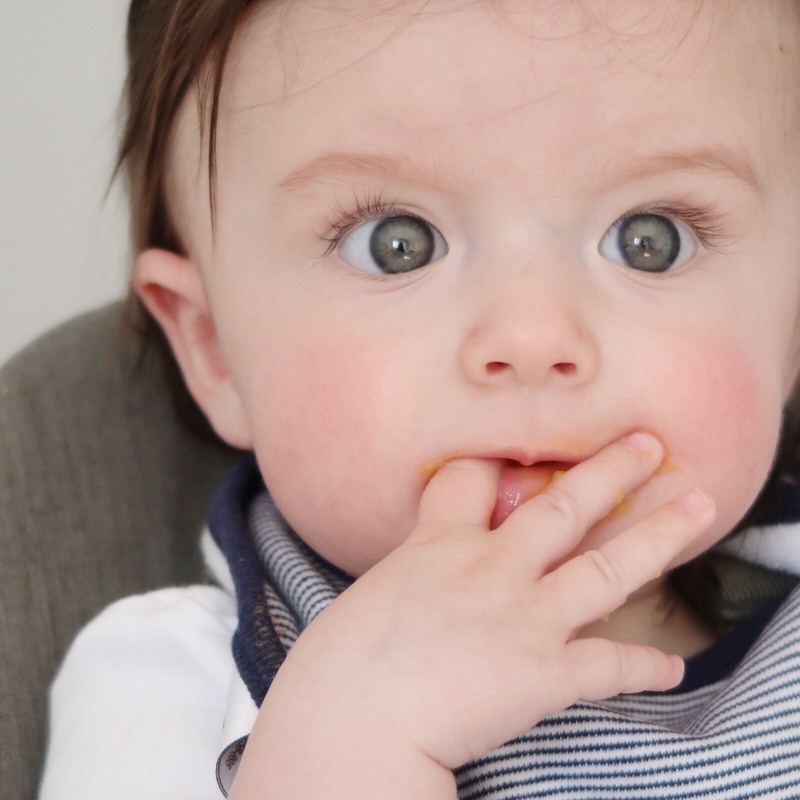 Here's 5 of the essential baby products that have helped us start weaning.. This high chair is an absolute dream. Oliver can't sit up completely unassisted yet, and this chair gives him really good support to keep him upright at meal times. We've tried feeding him in his pram and in the bumbo but he's at his most comfortable when he's sitting straight in his seat and he loves having the baby tray to bang on in between mouthfuls! When people say it's messy to wean, they're not kidding. I ruined so many of Oliver's vests and onesies in the first few days by using normal bibs. I then moved up to plastic wipeable bibs but these just distracted him and he was more interested in stroking the plastic than eating. The best ones I've found are the asda sleeveless ones as they're wipeable, have sleeves but don't have a stiff plastic fabric that distracts him. I am so worried about choking. After a few weeks, we introduced this feeder and it's really helped with his hand to eye co-ordination so he can learn how to feed himself. It's basically just a hand held feeder with a net that can be filled with fruit or veggies (you can see my lovely assistant Oliver giving a demo here). The net which prevents any big chunks coming through while still getting him used to eating proper food. Since discovering that rusks were full of sugar (seriously, why are they sold for babies?!) we switched to giving him banana or blueberry wafers. The wafers dissolve in his mouth and I've noticed they've really helped him get used to having bits of food in his mouth rather than soft purees. We always keep a few jars of baby food in our changing bag for when we're out and about but at home, we make our own. We use the BEABA baby cook to steam and blend fruit and veg. When you buy your own supplies and make it yourself, you realise how cheaply it can be done and it's actually really easy. Watch me make Oliver's favourite sweet potato, carrot and pear puree in this video. What were your weaning essentials?